Located in Mantua, Ohio Atlantic Water Gardens is a premiere manufacturer or water feature equipment. With dealers, distributors and a dedicated sales staff covering all of North America, Atlantic is ready, willing and able to help you with your next water feature project. 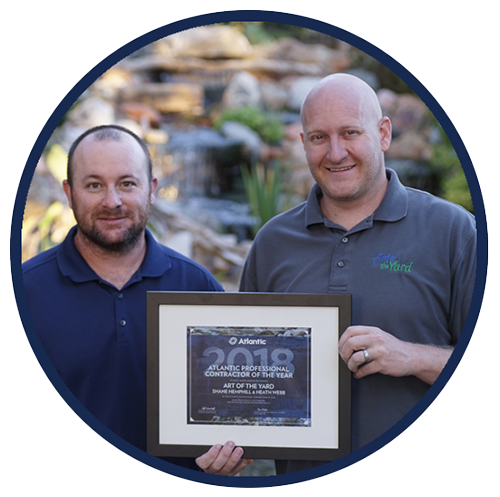 Congratulations to Shane Hemphill and Heath Webb of Art of the Yard, the 2018 Atlantic Professional Contractors of the Year! Shane and Heath were honored at the 2nd Annual Atlantic Professional Conference September 5-6, 2018 in Cleveland, Ohio. Serving Denver, Colorado and the surrounding communities, Shane and Heath have over 30 years of combined experience. They deliver the highest quality to their customers in everything they do, from new water features to maintenance plans and everything in between. Shane and Heath don’t have time to become complacent in what they do. They always push the envelope by trying new products, provide top notch customer service and never shy away from a tough job. They are very active on social media, showing off their beautiful work and assisting others. Shane and Heath received the accolade from previous APC of the Year Gerard Touhey, of Water Features by Gerard and Rex McCaskill of Pond Professors, Inc., the 2016 recipient, at the closing banquet at the Cleveland Aquarium and Windows on the River.